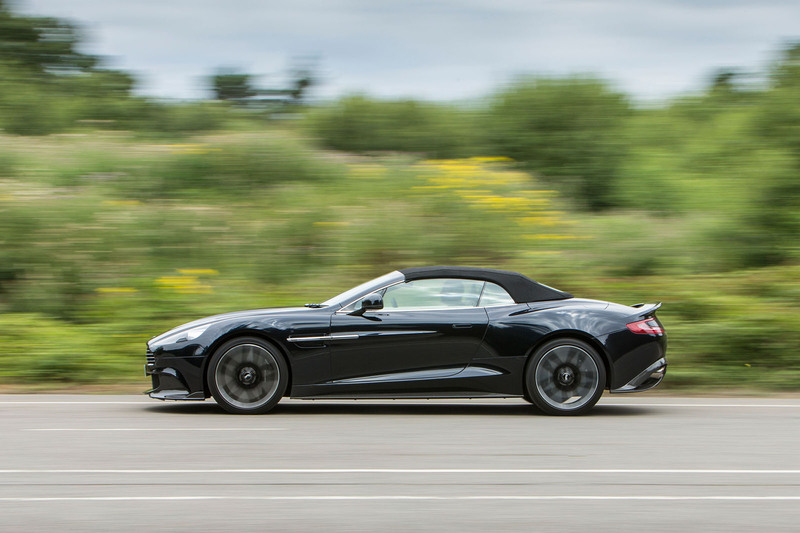 The changes wrought to the Aston Martin Vanquish S coupé at the start of the year were also made to the soft-top, the Volante, at the same time. But then the weather was cold, and now it is hot, so here we are, being given the opportunity to test the roofless Vanquish S for the first time. Those changes, then. Last year, Aston Martin felt that although its super-GT car was plenty GT enough, it wasn’t super enough, especially given the arrival of the DB11, and the need for this car to stay on sale for two more years. So it turned up the Vanquish’s wick and called it the Vanquish S.
Power from the 5.9-litre (badged 6.0), naturally aspirated V12 went up from 565bhp to 592bhp (600PS), and although peak torque stayed the same, at 465lb ft, there was more of it, more of the time. More noise, too, thanks to a freer-flowing exhaust that was part of the reason for the extra power, although the induction system was also revised. We’ve been running a Vanquish S coupé for a few thousand miles and the sound is pretty sensational and rarely tiring. Externally, the coupé received aerodynamic tweaks that made their way onto the Volante, too, although presumably they’ll have less effect here because the shape is less slippery overall. Where coupé and Volante differ most, though, is in their suspension. Both received tweaks, and coupé and convertible retain the same geometry, springs and anti-roll bars, but because of the Volante’s weight penalty, its adaptive dampers get their own rates to cope with the extra weight and its location. 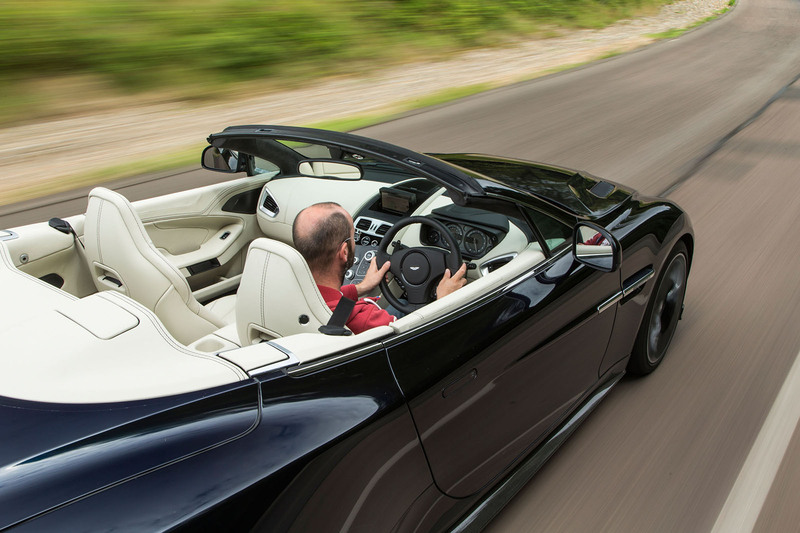 From that perspective, the Volante is a pretty old-school convertible. In the mid-engined market, we’ve become accustomed to roof mechanisms adding no more than 50kg and feeling no discernible loss of structural rigidity as a result. That’s not really the Volante’s way. This is a front-engined, aluminium-structured car with +2 rear seats, which means you’re chopping a large area of structural stiffness-enhancing material when you lop off the back of it. Then, in replacing it with a heavy electric opening/closing mechanism and thoroughly well-insulated fabric hood, you add 100kg or so, just where you don’t want it from a dynamic perspective – high. Inevitably, then, the Volante is less of a sports car than its coupé sibling. But, I suppose, that’s not going to be the choice – coupé or Volante – is it? It’ll be Volante or Ferrari California T, Rolls-Royce Dawn, or Bentley Continental GT Convertible. And against rivals from other makers, the Vanquish S is arguably even more competitive than its hard-topped sibling, because there’s no soft-top version of the Ferrari 812 Superfast to give it a hard time. Besides which, the Vanquish S’s character makes it through the roof cut largely unscathed. The ride remains good and, although you’re aware there’s more girth being carried around, body control is tight, too. There is flop, mind. Of course there is. Look in the rear-view mirror, which gets a little shimmy on over poor surfaces, and you’ll see the rear seat tops getting their own little shimmy going, too. The steering has more kickback and wobble than a stiffer car’s. But, heck, if you wanted the full super-GT experience, you wouldn’t be looking at a convertible. So sit back, enjoy the fact that the chassis balance inherent in every Aston Martin is very much present, that the steering is still linear, the throttle response crisp, the eight-speed automatic gearbox firmly locked with precious little ‘slush’, and the sound far easier to hear. The Vanquish is arguably the best-looking convertible you can buy. It’s more probably still the best-sounding. I’m not saying it is the best, but it’s in the top one. Twelve cylinders in natural balance, with not a turbocharger in sight to dim the noise, and with a free-flowing exhaust that opens the moment the noise-control homologation unit isn’t looking? How couldn’t it be? So there you go. A car that is, objectively, worse than its coupé sibling because cars with roofs are stiffer. But conversely, it’s the more competitive car against its natural rivals. Buy with impunity. ... I'd buy it for its appearance alone - is there a better-looking rag-top out there? Unusually, it's at least as nice with the hood up. is of course the Porsche Speedster. Alas, you can't buy one anymore. And the fifties Mercedes 300 SL and Jaguar XK 140 and the sixties Mercedes 220 SE Cabriolet. 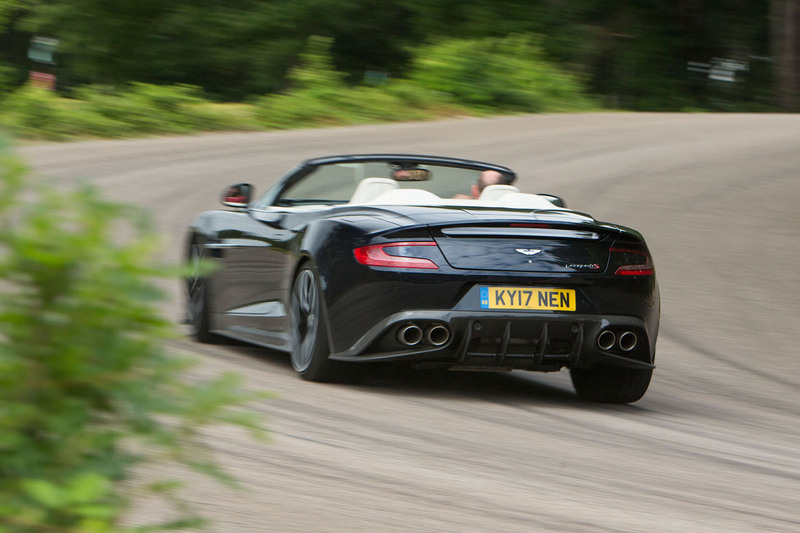 ..The Vanquish is arguably the best-looking convertible you can buy. .. Yes, very agruably as I'd go for Maserati GranCabrio Sport as the best looking convertible you can buy. Major want. Now where did I leave that £200k?